I do believe that title is as close as I’ll ever come to swearing in one of my devotions. Sometimes, in the face of a disaster, that’s all people feel like they can do. Look up at the sky, and curse. Of course, EF isn’t an abbreviated curse word — it stands for “Enhanced Fujita Scale”, the measure of a Tornado’s power. 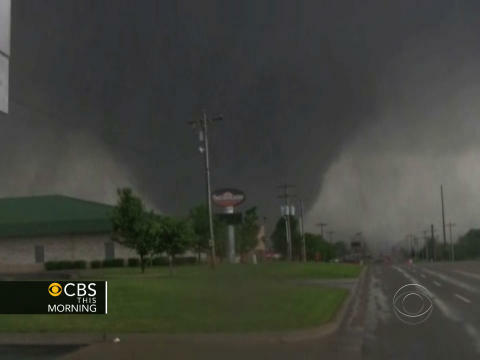 The one that hit Moore was at the top of the scale, an EF5, with sustained winds of more than 200 MPH. That’s an incredible amount of destructive power, doing unthinkable damage. Maybe “EF” does make a fitting curse word after all. The irony of it all is that this happened the day after Pentecost. The day after we celebrated the Spirit’s entry and the rush of a mighty wind. The day after we spoke of God’s power, unleashed on the world. There are some idiots out there (there always are) who claim such a tragedy is the work of a vengeful God, but if Pentecost teaches us anything, it’s that God’s power came to be a BLESSING, not a curse. The Holy Spirit is what fuels the church. It’s what puts love into action. It’s what prompts us to look up at the sky, and pray. I’m embarrassed to say that I’ve always wanted to see a tornado in person. I’ve lived in Kansas for 28 years and never have. I think there’s something compelling about seeing nature’s power at work. Now I’m not so eager. If I ever do see one, I won’t “ooh” and “ahh”. I may in fact direct some curses towards it. Thankfully, tornadoes are fairly rare. But friends, I could not count the number of times I’ve seen the Holy Spirit at work in unexpected and mysterious ways. In us. Reminding us that there are things we can do in the face of a disaster. Donating. Volunteering. Caring. Praying. God counters every powerful curse with a more powerful blessing. 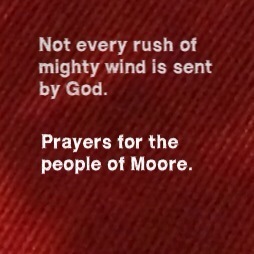 An EF5 leaves a permanent mark on a people and a city, but the mighty wind of the Holy Spirit never stops blowing. This is a power that will forever change the world. « Oh the places you’ll DOH!